From Ancient Greek Εὐρώπη (Eurṓpē), a character name in Greek mythology. (Greek mythology) Several characters, most notably a Phoenician princess abducted to Crete by Zeus. (astronomy) 52 Europa, a main belt asteroid; not to be confused with the Jovian moon. Deutschland liegt im Herzen Europas. Borrowed from English Europe, French Europe, German Europa, Italian Europa, Russian Евро́па (Jevrópa), Spanish Europa, ultimately from Latin Eurōpa, from Ancient Greek Εὐρώπη (Eurṓpē). 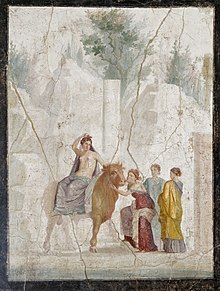 Europa seated on a bull (Jupiter in disguise), in fresco from Pompeii, 1st century AD. The world according to Herodotus showing Europa near the top of the map. From Latin Europa, from Ancient Greek Εὐρώπη (Eurṓpē). Hun kan alle hovedstedene i Europa. She can name all the capitals in Europe. Online Etymology Dictionary entry on "European"
Ho kan alle hovudstadene i Europa. 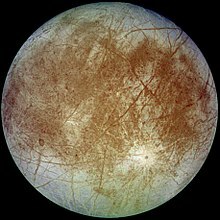 For quotations of use of this term, see Citations:Europa. From Latin Eurōpa, from Ancient Greek Εὐρώπη (Eurṓpē).